Gerade bekam ich mein Designteam Paket von ScrapMuse – Ohhhhhh yummie!!! Ich sag Euch die Papierchen und Embellishments sind wunderschÃƒÆ’Ã‚Â¶n und ich kann es gar nicht erwarten damit anzufangen. Hier ist es – es wird am 15. April an alle Besteller verschickt. 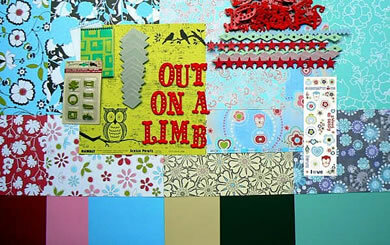 I just got my Design Team Package from ScrapMuse – Ohhhh yummie!!! I tell you those papers and embellishments are just so beautiful and I can’t wait to work with the kit.Ãƒâ€šÃ‚ Here it is – it will be shipped on April 15. Hier nochmal die Informationen fÃƒÆ’Ã‚Â¼r unsere Workshops am 21.04.2007 in Hamburg – es sind noch einige PlÃƒÆ’Ã‚Â¤tze frei und Ihr habt noch eine Woche Zeit Euch anzumelden. Here are our informations for the workshops in Hamburg on April 21st – there are still a couple places open and you have still a week to register. 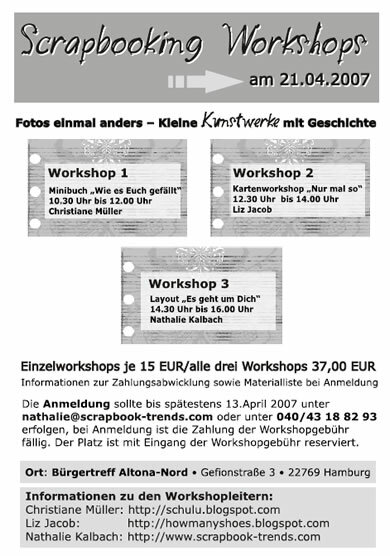 The Workshops are sponsored by the shops Creativ Freizeit and ScrapbookKing! Wir freuen uns sehr auf Euch! We are looking very forward seeing you! You can’t leave us hanging like this!!! mmmmmmm, that kit looks yummy! Yay! you got your kit! Cant wait to see what you do with it! IT is YUMMY huh?